During the month of February, 1945, the 7th Armored Division was billeted in the vicinity of EUPEN, BELGIUM as Corps reserve of the V Corps, First U.S. Army. The division as a whole was never committed during this period although some of its battalions saw action under attachment to the 78th and 99th Infantry Divisions. Training and maintenance were carried on throughout the month and from 11 to 28 February, the division helped in the First U. S. Army road maintenance program. Division Artillery stayed in general support of the 78th Infantry Division from 4 February through the end of the period. A/ 33rd Arm'd Engr. Bn. 3967th QM. Tr. Tr. Co.
87th Cav. Rcn. Sq., Mecz. 33rd Arm'd Engr. Bn. (-). 814th TD Bn. (-). . The attached units were the 203rd AAA Bn., 814th TD Bn., 275th Arm'd FA Bn., the 446th QM Tr. Co., and the 3967th QM Tr. Tr. Co. The division's activities during the month can be broken down into three phases: units in combat, the First U.S. Army Road Maintenance Program, and a training and maintenance schedule. At 030700 February, the 23rd Arm'd Inf. Bn., was detached from Combat Command "A" and attached to the 78th Infantry Division. 23rd Infantry Under orders from that headquarters, they left HENRI - CHAPELLE, BELGIUM at 1200 and by 2300 had completed the relief of the 2nd Bn., of the 309th Inf. Regt. in their sector 2½ miles to the northeast of LAMMERSDORF, GERMANY. From 4 to 10 February, their immediate front remained quiet and little enemy activity outside of an occasional mortar or artillery shell was reported. Agressive2 action in the form of reconnaissance patrols brought in much valuable information as to the location of pillboxes, booby-traps, S-mines, anti-personnel mines, and barbed wire entanglements. At 1200 on 10 February, the battalion was relieved from attachment to the 78th Inf. Div. and returned to the control of Combat Command "A". The mission was initially to seize and clear the villages of STRAUCH and STECKENBORN thereby securing the 78th Division's south and southeast flank. At 0630 on 5 February, TF LUTZ crossed the LD (WITZERATH - KESTERNICH road) under cover of darkness and by 0700 reported that it was in position on Objective Dot (010245) without having met any opposition, Col. Francis P Tompkins, the C.O. of CCR directed the Task Force to remain there until it received his orders to advance, The Commanding General of the 78th Inf. Div. had cancelled the planned Artillery preparation as early reports showed all units were unopposed and reaching objectives with little or no organized resistance. At 0700 TF MCDANIEL launched its attack and by 0800 reported their position as 400 yards northeast of the Objective HEDY (STRAUCH) with no Germans seen. TF LUTZ now moved out again proceeding toward its next assigned mission, Objective Peggy (STECKENBORN). TF MCDANIEL completed the occupation of STRAUCH and by 1100, the battered little village was rid of the last sniper and secured. TF LUTZ in the meanwhile was meeting increasing opposition from enemy installed in pillboxes and strong points to the east of STECKENBORN. At 1300, TF LUTZ reported that it had moved into the western end of STECKENBORN and was being held up by a minefield and by small arms fire from the pillboxes. Col. Tompkins ordered immediate employment of available TD's and tanks for direct fire on strong points ------ and aggressive continuation of the mission. At 1645, the last enemy resistance was overcome and TF LUTZ radioed in that STECKENBORN was secured. The task force commanders were ordered to consolidate their positions for the night. The plan for the following day was for CCR to assist in and support the attack on HECHELSHEID to be made by the 310th Inf. Regt. A platoon of B/40th Tank Bn. was to be attached and the attack was to jump off at 0600 on the 6th. The next morning, the 310th Inf. Regt. took HECHELSHEID. TF LUTZ was dissolved at 0915, its components reverting to their parent units. TF MCDANIEL was reinforced by the following attachments: A/87th Cav. Ran. Sq. Mecz., D/203rd AAA Bn., and 1/B/814th TD Bn. At 1315 this TF was ordered to relieve elements of the 78th Inf. Div. in HECHELSHEID and assume responsibility for that sector. Once there, TF MCDANIEL established a defensive position along the general line (028292 - 048273). From 7 to 10 February, Combat Command "R" remained in support of the 78th Div. Their primary mission was to mop up the areas that this division passed through. They also did some reconnaissance work and established a screen to the south and southeast of their sector. Combat Command "R" was released from the 78th Inf. Div. and returned to the 7th Armored Div. control at 101200 February. The Artillery In Action Division Artillery was in general support of the 78th Inf. Div. during the greater part of the month. Seventh Armored's organic artillery battalions plus the 275th Arm'd FA Bn., an attached unit, were alerted on 3 February to move into the 78th Inf. Division's sector. At 031400, February, 489th Arm'd FA Bn. left its billets in VERVIERS, BELGIUM and had closed in position in the HURTGEN FOREST, 7000 yards NE of ROETGEN, GERMANY by 1800 that evening. They were to furnish direct support to the 23rd Arm'd Inf. Bn. On 4 February, the remaining battalions in Division Artillery moved into the zone of the 78th Inf. Div. closing in firing positions near LAMMERSDORF by 1800. The 440th Arm'd FA Bn. was in direct support of Combat Command "R" and was reinforced by the 275th. The 434th was in general support. The 489th remained with the 23rd Arm'd Inf. Bn. until relieved on 051500 February, when they moved to an open field on the hillside outside of KESTERNICH and went into general support. The 434th together with the 440th and the 275th displaced forward to the outskirts of the village of STRAUCH on 7 February. Night and Interdiction Fires The week of 6 February to 12 February saw as heavy firing as any the artillery had done since the initial landing in France. This consisted largely of TOT's and comprehensive all-night programs of harassing and interdiction fires requested by the 78th Inf. Div. The object of this intensive fire was two-fold: first, to support the 78th Inf. Div. in its attack on the bitterly contested little road junction of SCHMIDT, and subsequently to support both the 78th and 9th Inf. Divisions in the operations against the two dams in the vicinity of the RUR-URFT LAKES. 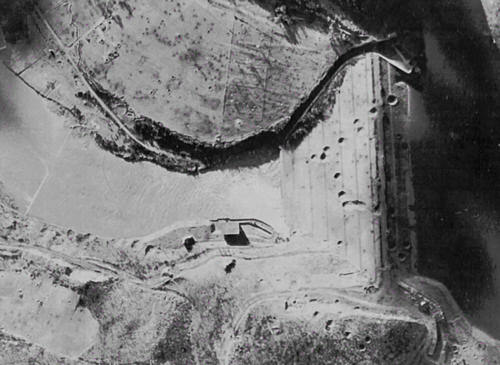 Both dams, after a considerable struggle, were taken, but not until the enemy had dynamited the flood gates and caused a rise along the entire ROER RIVER. After 12 February, the amount of fire called for diminished noticeably although from that date to the end of the month, enemy positions on the east bank of the ROER were pounded on a number of different occasions. The 275th Arm'd FA Bn. was relieved from attachment to the 7th Arm'd Div. 200001 February. The other artillery remained in their positions in the fields and were able to accomplish some training and a good deal of vehicular maintenance in addition to their continuous support of the 78th Inf. Div. Source: 7th Armored Division Document Repository.